Compaq(t). Are you looking for a small high-quality secondary notebook? 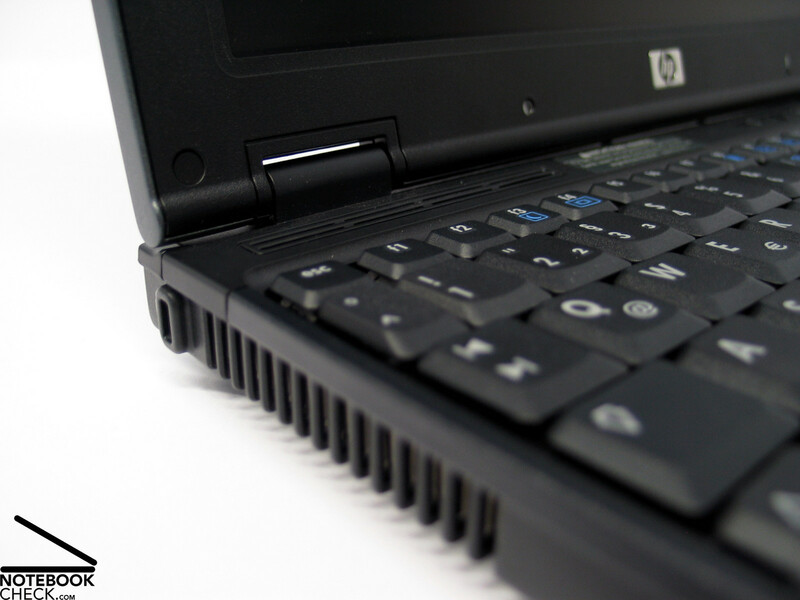 The HP Compaq nc4400 could attract you. 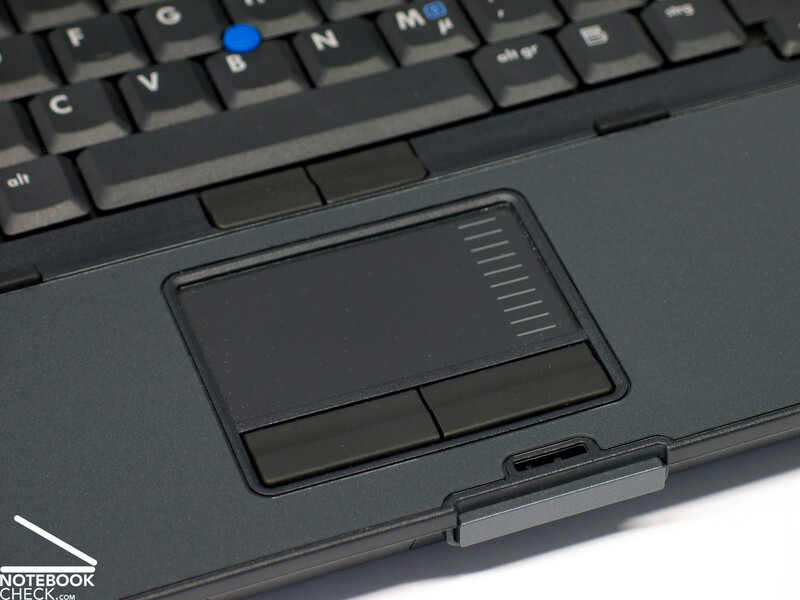 This 12" subnotebook features a robust case, hoch-quality input devices and misses out an optical drive and therewith is even smaller and lighter. 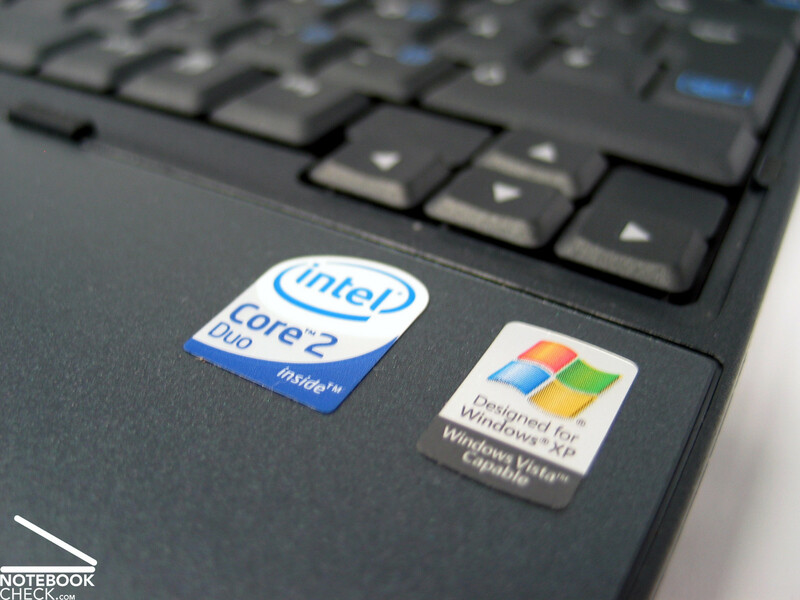 A Core 2 Duo CPU provides sufficient power. Some things get apparent relatively fast by handling the notebook. First of all the XGA Display (not wide screen), which looks like undersized with its comparably broad frame. Secondly, the keyboard, which extends to the outer edge and promises good typing comfort. Finally, the missing optical drive. The case seems high-quality and robust and has good haptics. The base unit seems to be out of very robust plastics or magnesium alloy. In the hand ball region, a coated plastic is used, similar as already known by its HP fellows. The display cover is also out of magnesium. We could not observe any weaknesses of the nc4400 during our reviews about stability of the case under pressure or regarding possible deflections. No matter where one presses or pulls, the notebook is absolutely inherently stable. This is partly also true for the very slim display. However, the more to the top, the bigger are the possible deflections. Still, the display and the whole notebook at all is always free of creaking noises. Both hinges seem to be rather small, but they do not have any troubles with the small display. The display can be precisely positioned with adequate force and does not wobble or see-saw in any way. The transport hook is especially innovative. Whilst there is no hook or something similar visible , if the display is open, a small metallic hook moves out between display and base unit of the case at a distance of about 5mm and locks the display absolutely securely, if you are closing the display. The mechanism should be based upon magnet technology. 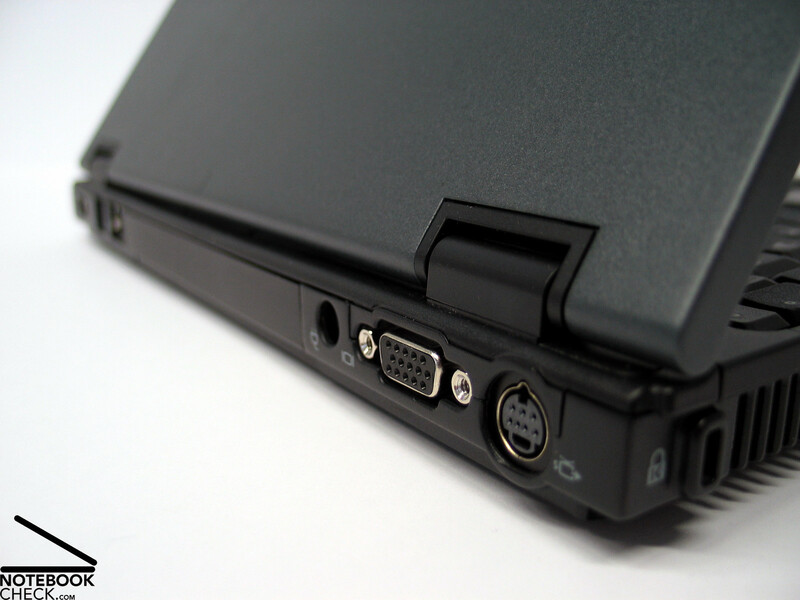 The interfaces are partly at the back side of the notebook, partly in the middle region on both sides. The order is in total alright. 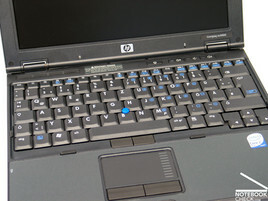 Although there is definitely less space in 12"cases than in 15" or even 17'' notebooks, the HP technicians were able to integrate a rather spacious keyboard into the nc4400 by skillfully using the total width of the case. 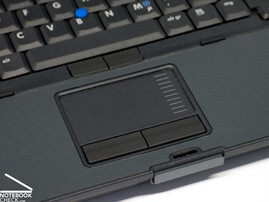 Regarding size, some keys needed be be dimensioned a little smaller than usual, however, the most important function keys (enter, space bar, shift, Backspace) and the number keys do not differ much from those of bigger notebooks. The F-keys as well as some function keys (Ins, Del,...) were dimensioned clearly smaller. The layout is despite of the dense order alright. Even typing does not really feel different from big keyboards and can be well called comfortable. Only the travel might be a little short. 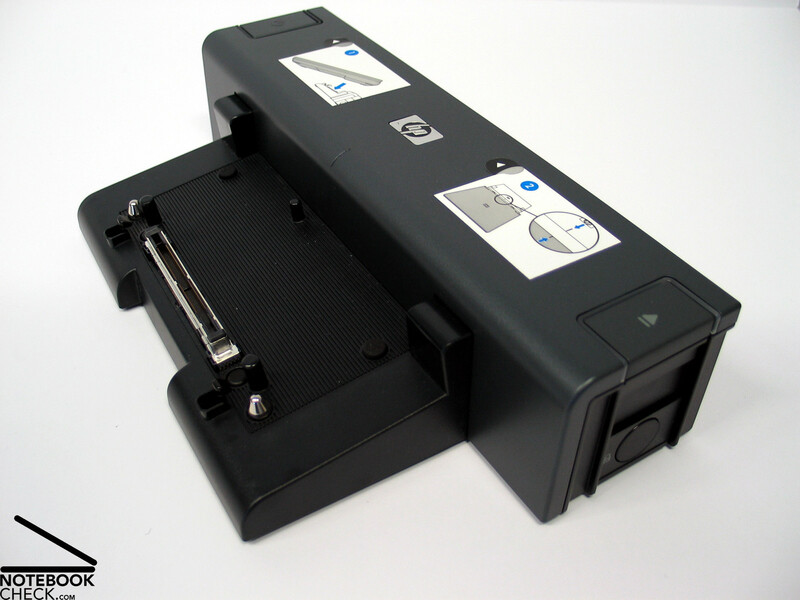 The nc4400 also has a touch pad/track point combination, which is in general alright in use. The according keys could protrude the case a little more, which would ease their use even more. 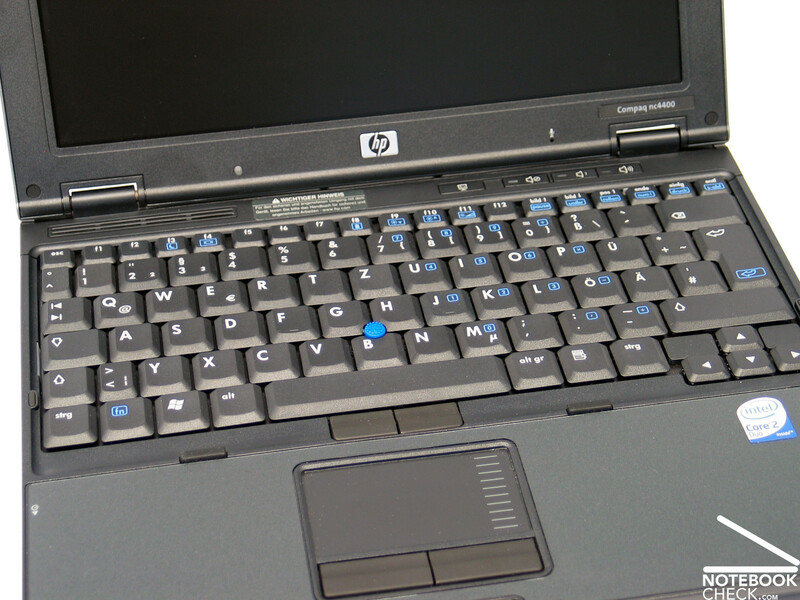 Above the keyboard there are some additional keys (Audio) and at the right edge of the display's case a fingerprint reader was integrated. 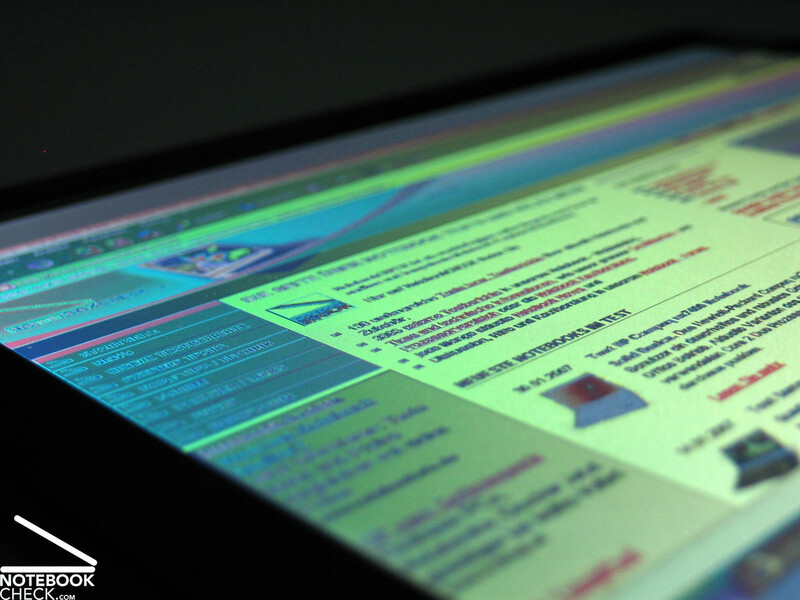 Against the current trend, the Compaq nc4400 is not equipped with a wide screen display. Instead, a matt 1024x768 pixels XGA panel is used. 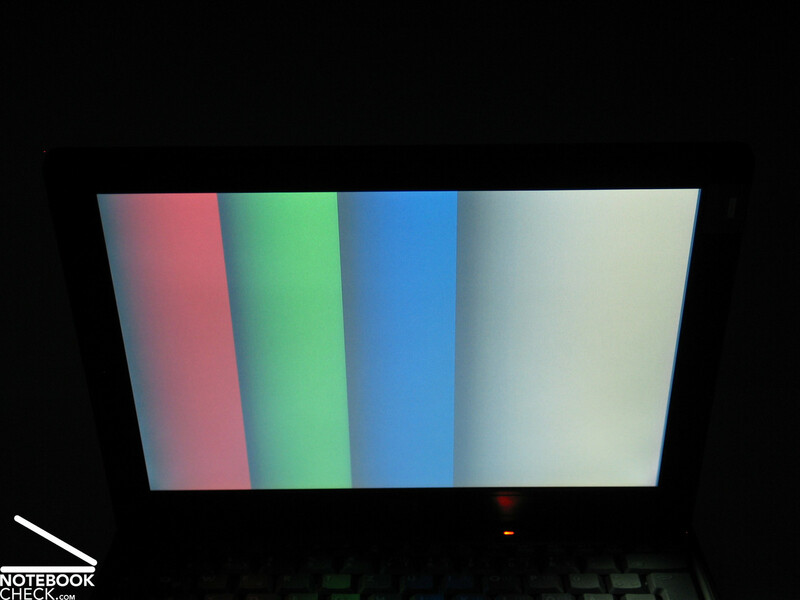 The display rated excellent during the review of its brightness and reached a maximum of 170.9 cd/m² in its center. Even the illumination of 82% is alright. 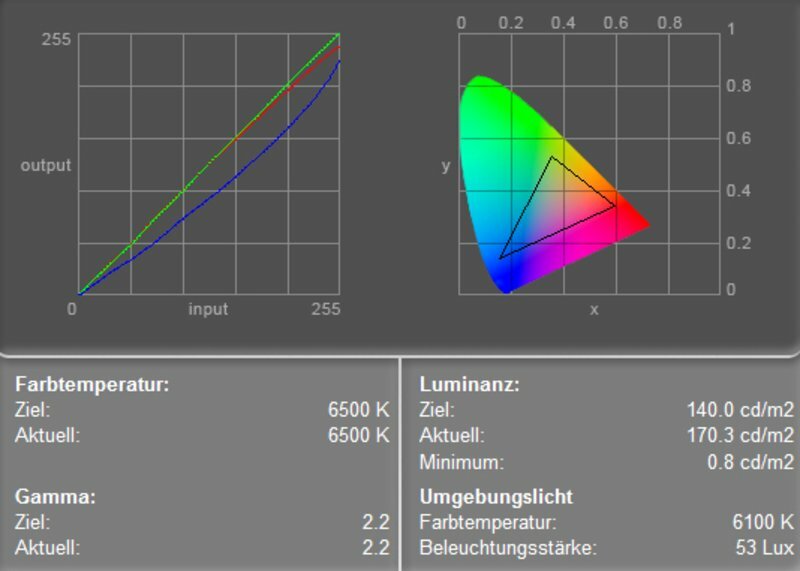 The color diagram depicts a nearly ideal green and red color curve and a clear deviation of the blue color curve. This leads as usual to warmer colors. The maximum contrast is passable at 214:1, because of a black value of 0.8 cd/m². 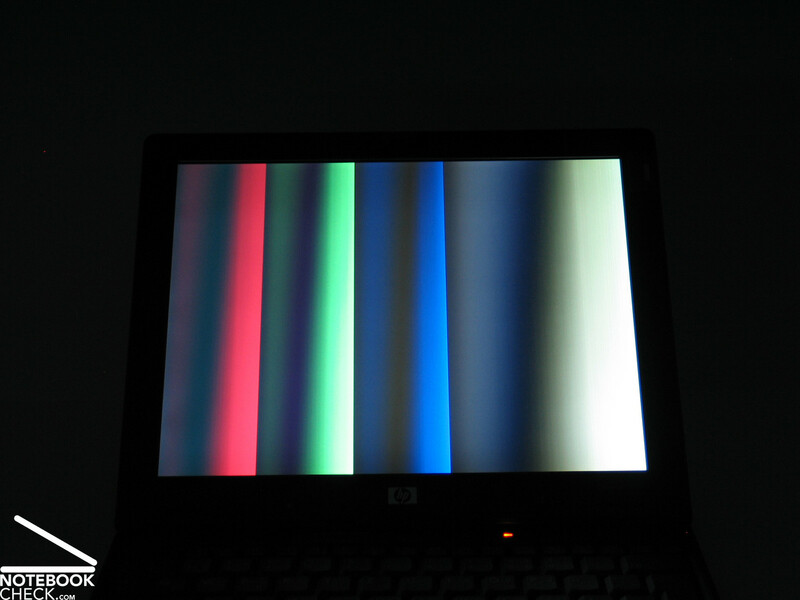 Because of a good brightness (minimum of 140.2 cd/m²), a good illumination, and matt and therefore non-reflecting display, it should be possible to use the HP Compaq nc4400 also outdoors without problems. The stability to the vantage point is compared to the other measurement data not really convincing. 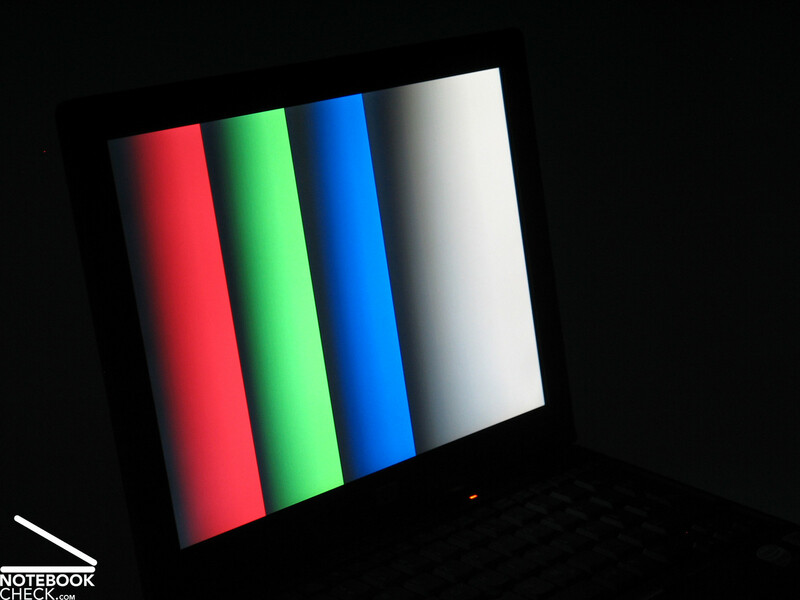 Vertically, you can observe a darkening and a change of colors, when looking from bottom to top and a heavy contrast loss, when looking from top to bottom. Horizontally, the stability to the vantage point is acceptable. 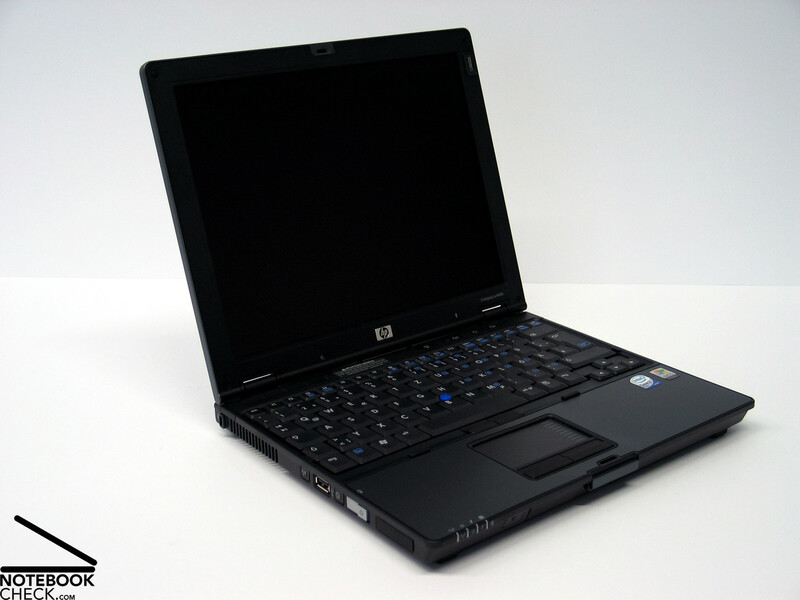 The HP Comaq nc4400 is available with a variety of CPUs, up to a Core 2 Duo T7200 processor with 2.0 GHz. 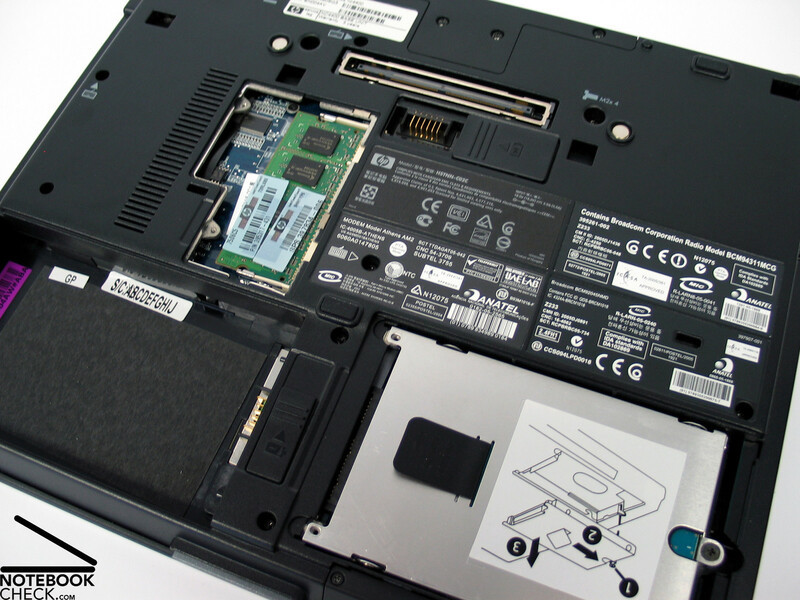 The notebook we reviewed came with a T7400 CPU and an Intel GMA 950 video chip. Therewith this subnotebook is well equipped regarding calculation power and there should not be any unpleasant surprises at calculation intensive applications. 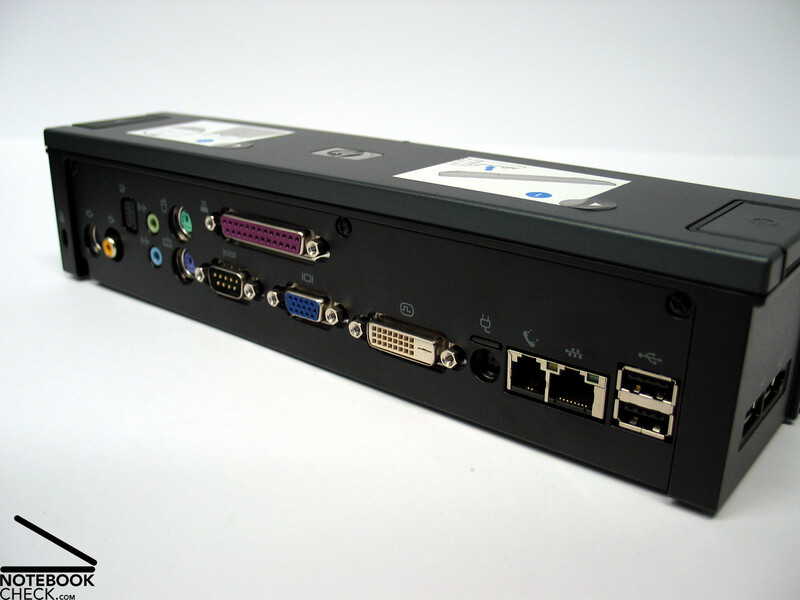 Regarding graphics the GMA 950 video chip provides more or less a basic equipment, where you can't expect too much. It is alright for older games as well as Windows Vista, but 3D applications and games can't be used without troubles. The 60 GB hard disk of Fujitsu had slightly above-average results regarding transfer rates and access time. 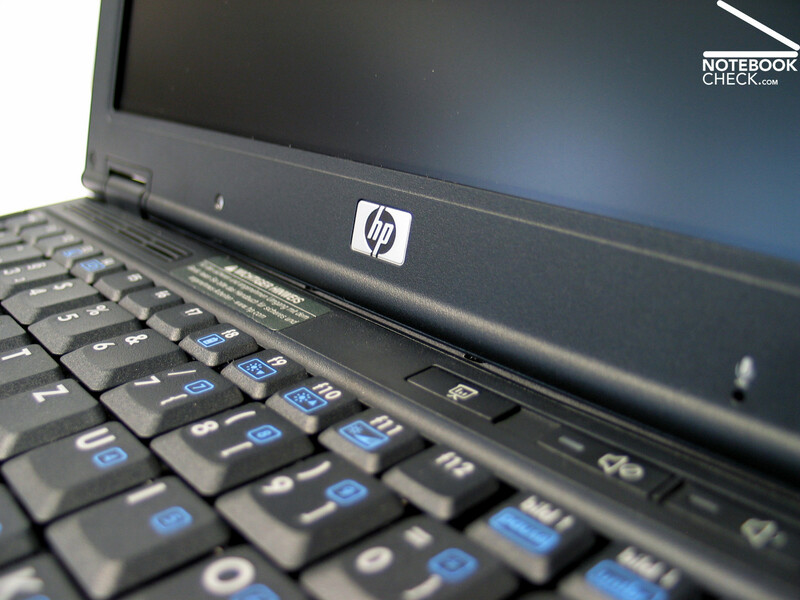 Besides a 60GB version, HP also offers a 80GB hard disk. 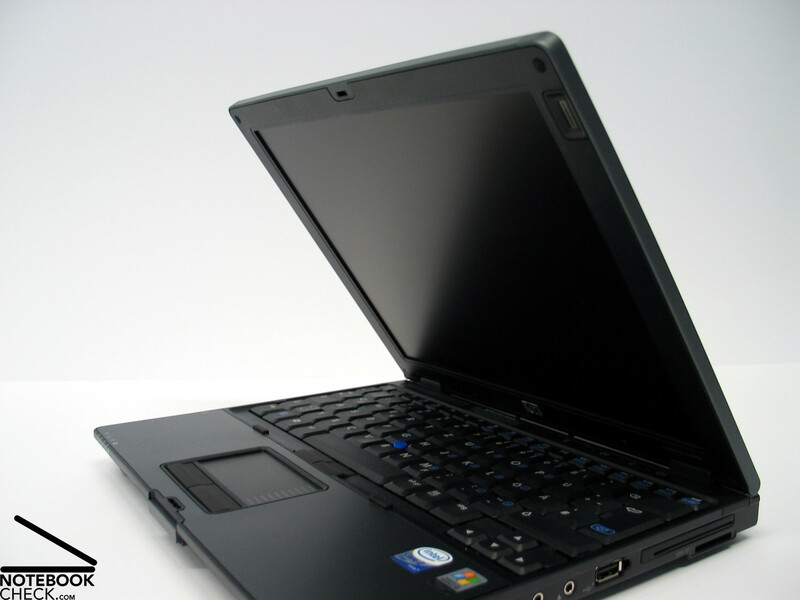 The notebook is very quiet in idle mode, because of the deactivated fan, you can hardly hear anything at all. Depending on the load the fans will be activated and reach a noise of about 36.1 dB. Still, the noise is very decent. Under load a maximum noise of 43.0 dB is possible, which seems still tolerable. The top side of the nc4400 does, even under load, not show any exiting anomalies. However, at the bottom side a clear temperature increase in the region of the maintenance opening and the memory modules is possible. We could measure a maximum of 46°C in this region. During normal operation the temperatures should, however, be within reasonable limits and should not cause big troubles during mobile use. 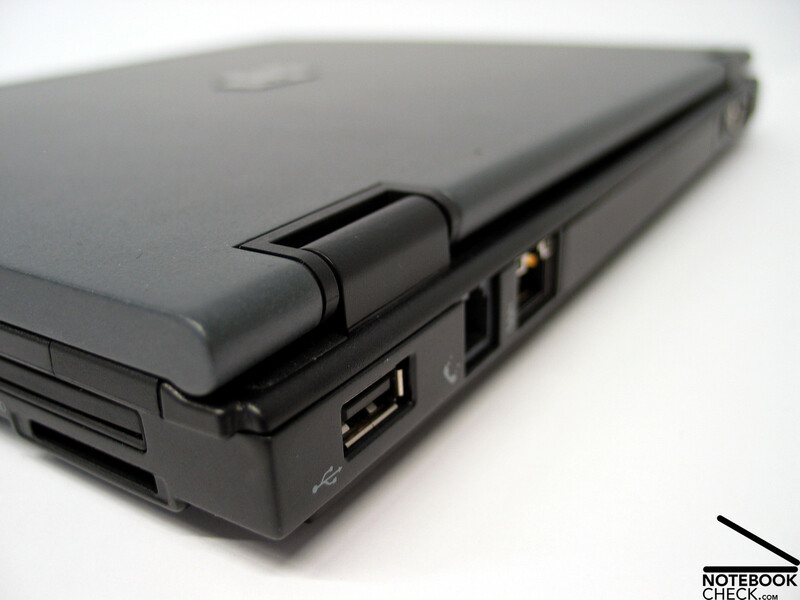 The HP Compaq nc4400 has only a single speaker, which is at the left side near the front. This one-sided mono sound is best for Windows sounds, but not really of use for music. This aspect is especially important for mobile subnotebooks. 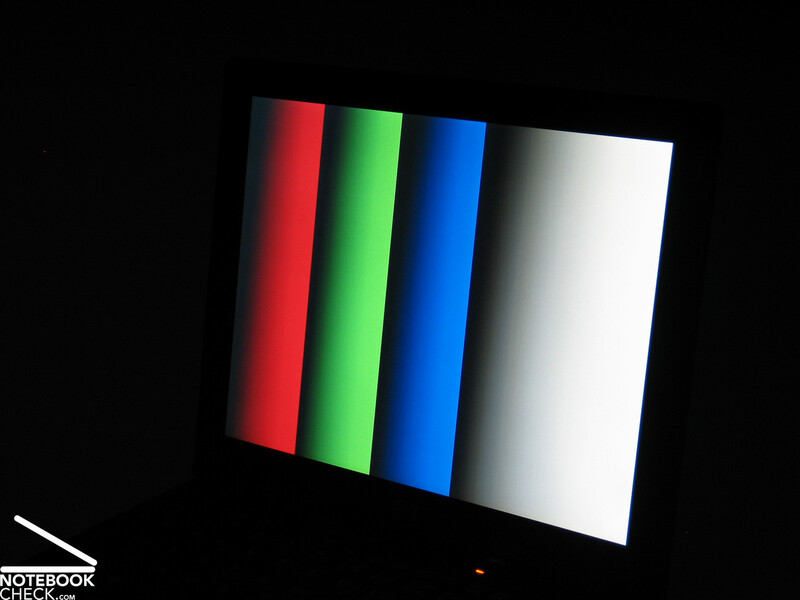 The nc4400 has an excellent maximum runtime of about 5 hours at reduced brightness. However, under load the battery is empty within a little more than one hour, because of the energy demanding Core 2 Duo CPU and the 55Wh Akku (5100 mAh). So, you should turn down down your performance demands, while being away. The Hewlett-Packard Compaq nc4400 proved to be a tiny and robust notebook. The high-quality materials (mostly magnesium) feel not only alright, they also make the notebook stable and resistant against pressure and deflection. 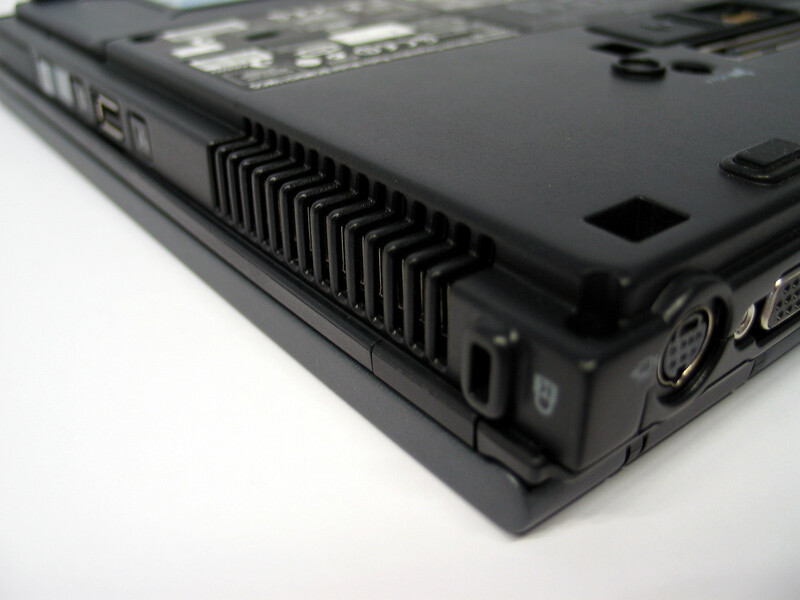 The missing DVD drive hurts in the beginning, however, if one does not use the notebook as mobile DVD Player, one gets quickly used to it. Especially, if it is integrated in an existing work environment with desktop computer, network and docking station, one can live very well without it. Furthermore, an external drive is available, too. 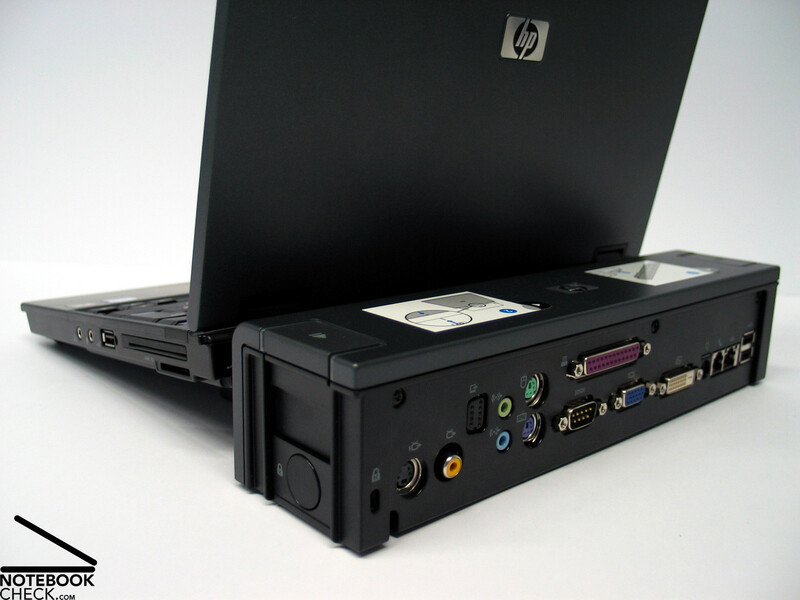 The docking Station of HP provides a variety of interfaces, which turn the nc4400 nearly into desktop replacement notebook. The keyboard is, considering it is a 12 inch notebook, spacious. 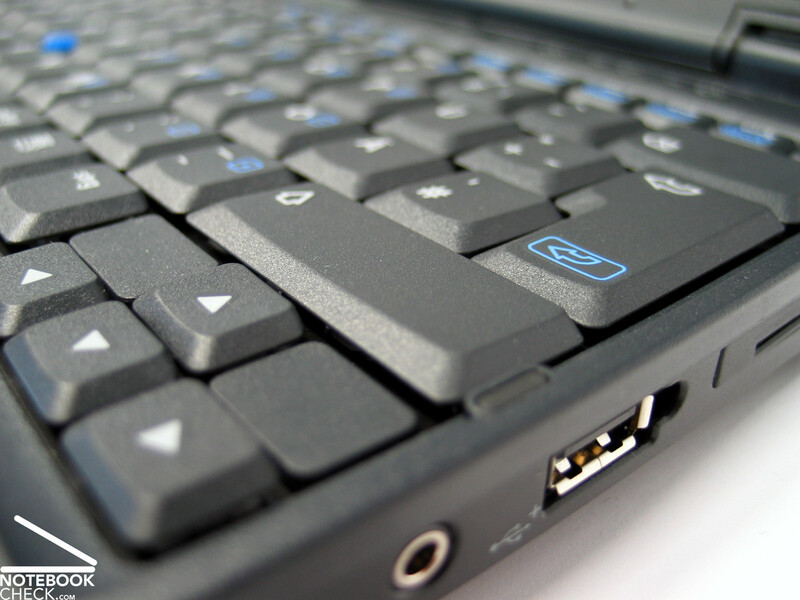 Although the F-keys are dimensioned clearly smaller, the standard keys are of normal size and the keyboard can be well used for longer typing durations. The unusual display in Format 4:3 is, despite of the not really good stability to the vantage point, alright and because of its good brightness also well suited for outdoor operation - an important aspect of subnotebooks. Slight weakness: The resolution of 1024x768 pixels provides only a limited overview when working with many open applications under Windows. 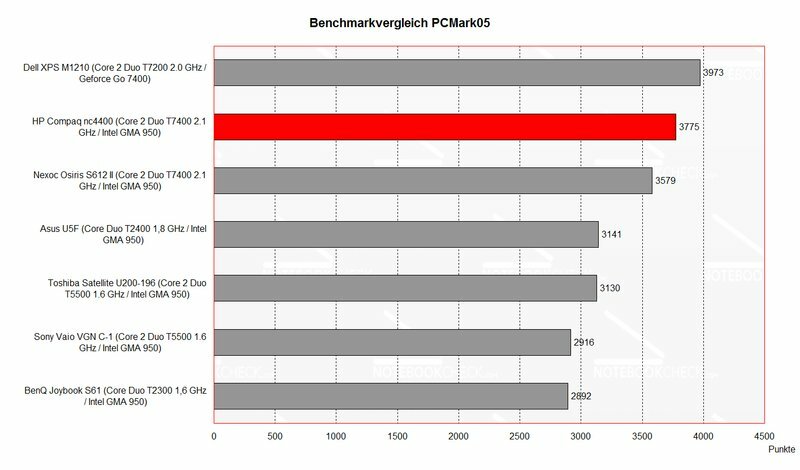 The powerful Core 2 Duo CPU provides sufficient calculation power. The GMA 950 video chip can also be used with Windows Vista. 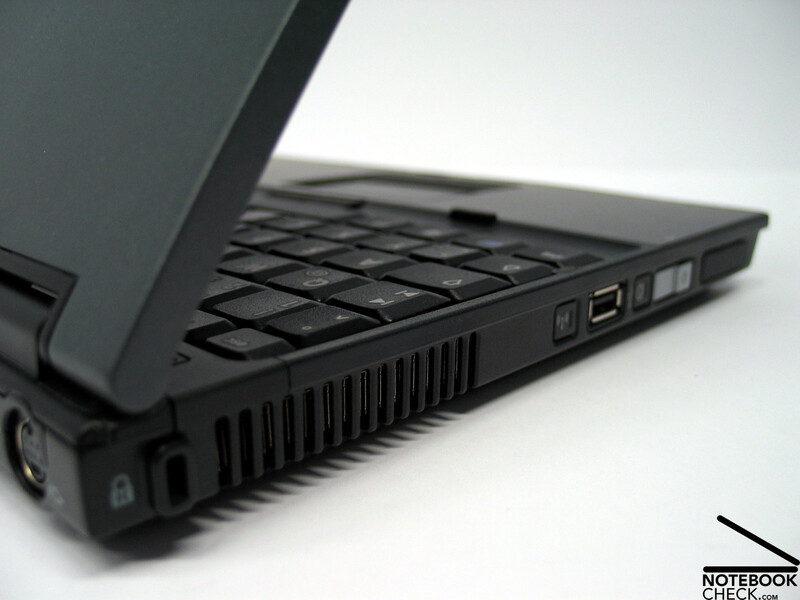 The battery runtime of the nc4400 with T7400 CPU is between a little more than one hour and up to 5 hours. At reduced demands the notebook can well be used mobile. 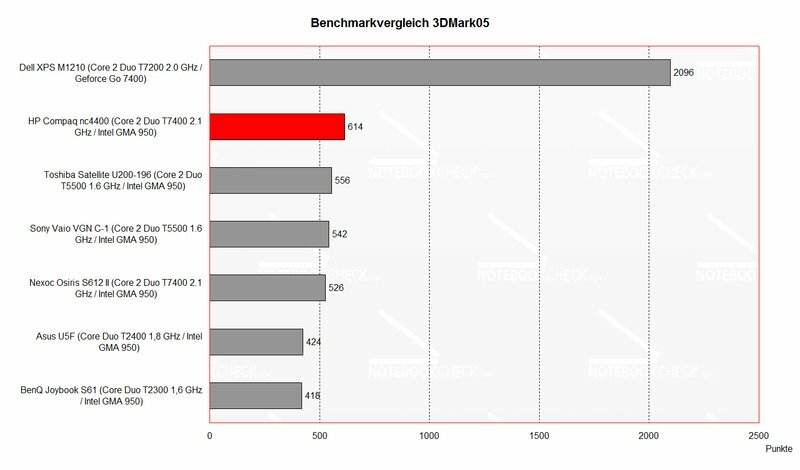 Unbelievably, but the notebook is equipped with a T7400 CPU. The matt surface and the good brightness should enable the user to work even outdoors. ...and can well be used for mobile typing. 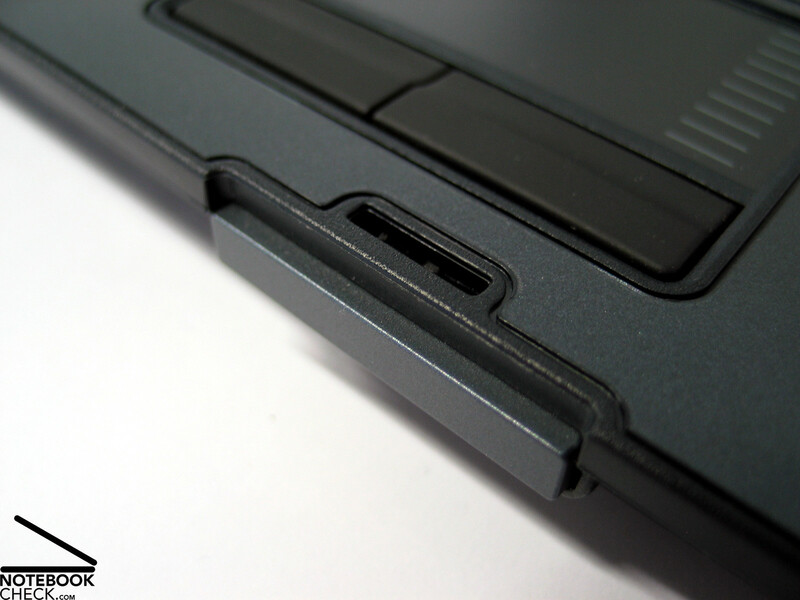 The ports are more or less reasonably placed at the back and at both sides. The innovative transport hook suits well to the high-quality case. ...and also let it appear first-class. ...but on the bottom side the temperature clearly increases.